Election Tracker LIVE Updates: The Congress party on Thursday released another list of 31 candidates for the forthcoming Lok Sabha elections, fielding former MP Manvendra Singh from his earlier stomping ground of Barmer. Rajasthan chief minister Ashok Gehlot’s son Vaibhav has been given a ticket from Jodhpur. The list of 31 candidates features the names of six candidates from Gujarat and Uttar Pradesh each, apart from 19 nominees from Rajasthan. Congress releases a list 31 candidates for the upcoming Lok Sabha elections in Gujarat, Uttar Pradesh and Rajasthan. Jitendra Singh to contest from Alwar, Vaibhav Gehlot, son of Rajasthan chief minister Ashok Gehlot, from Jodhpur, Manvendra Singh from Barmer, Badri Ram Jakhar from Pali and Rafique Mandelia from Churu. Congress leader Divya Spandana writes to Election Commission of India against social media pages for allegedly "offering free gifts to voters enticing them to support Modi. Derek O’Brien tweeted, “Political vendetta on a nasty tour of India. After Bengal, Delhi, UP, Andhra, Bihar and other states, the BJP government, whose expiry date is over, now does more political vendetta. This time, Karnataka. We condemn this pathetic action.” The tweet comes after the protest by Karnataka Chief Minister HD Kumaraswamy, Deputy Chief Minister G Parameshwara and other senior leaders outside I-T office, against Income-Tax raids at residence of JD(S) leader and Karnataka Minor Irrigation Minister CS Puttaraju in Mandya. Congress general secretary for UP-East Priyanka Gandhi Vadra tells workers in Rae Bareli to stay away from BJP’s ‘WhatsApp university’. 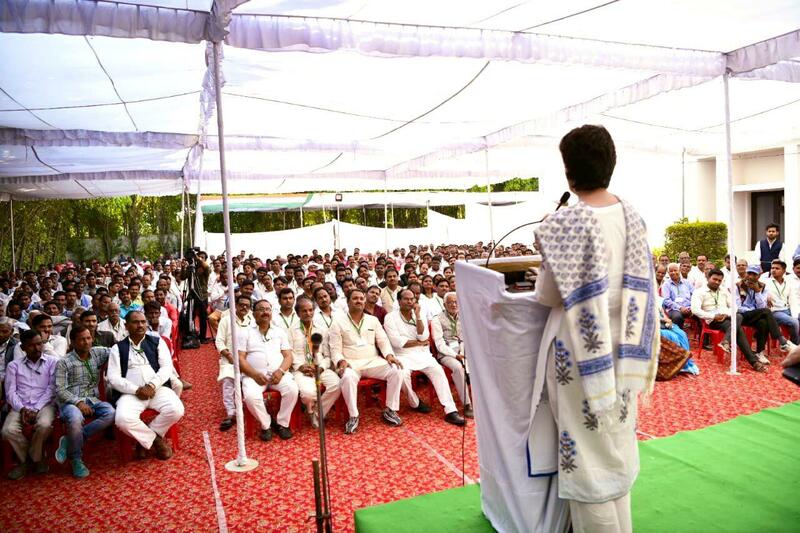 “You must counter their ‘fake news’ narrative with real news on social media”, Priyanka told party workers. 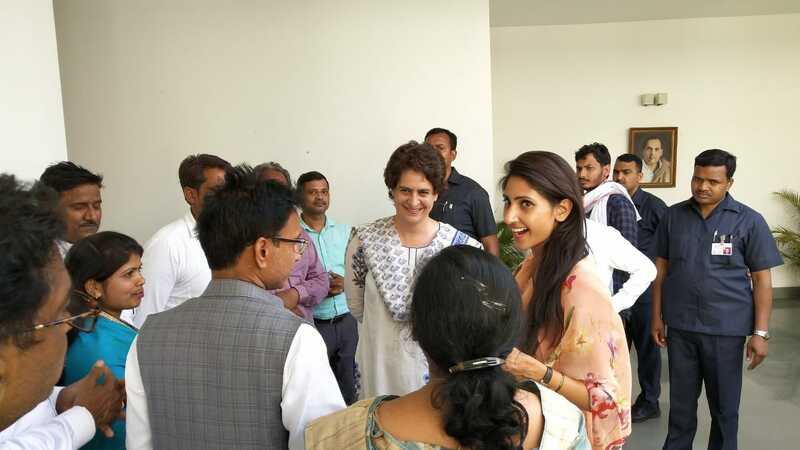 “Young leaders of the Congress party like you must be very active on social media and push out real issues this election season”, she said to youth workers of Rae Bareli. She also told workers that she wants them to also prepare for 2022 with full force. “Will form government in UP in 2022”, she said. Election Commission has nominated Vivek Dube as the Central Police Observer for West Bengal and Jharkhand. KK Sharma who was earlier nominated for these states has now been assigned Andhra Pradesh and Telangana instead. 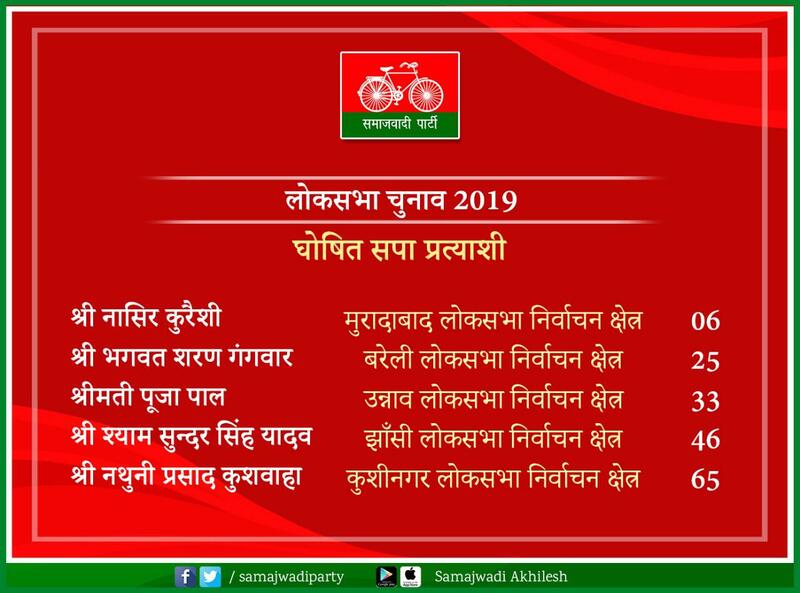 Pragatisheel Samajwadi Party released its candidates list for the upcoming Lok Sabha elections in Uttar Pradesh and Karnataka. Shambhu Dayal Dohre will contest from Etawah in Uttar Pradesh. Visuals of Congress General Secretary for UP-East Priyanka Gandhi with Rae Bareli MLA Aditi Singh. JD(S) supremo HD Deve Gowda said, “They (BJP) tried to persuade Kumaraswamy to form the government with the support of the BJP. Before the election they extended huge money for the expenditure of JD(S), they tried to persuade him to meet them in Mumbai where money was kept but Kumaraswamy refused to budge." 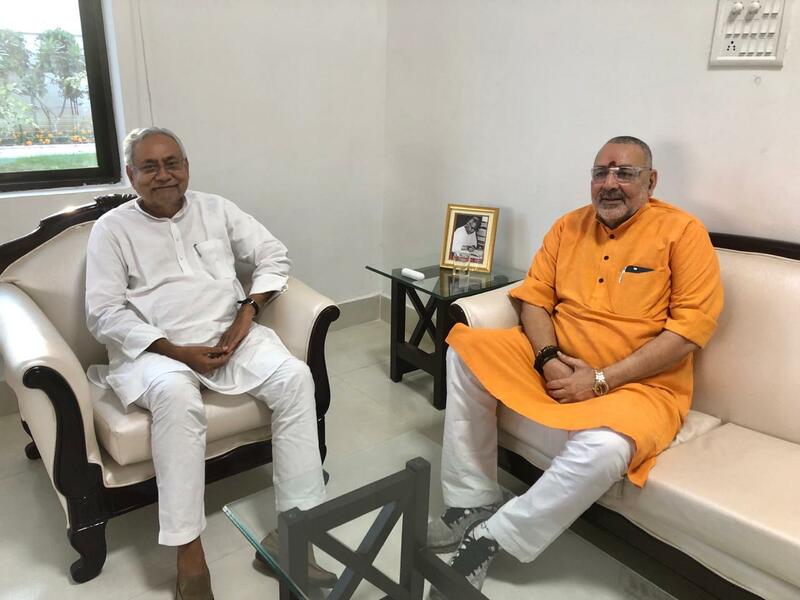 BJP’s Giriraj Singh is on a meeting with chief minister Nitish Kumar. Singh will file his nomination from Begusarai on April 6. He will be visiting Begusarai on Friday where he will take on former JNU students union president Kanhaiya Kumar. Congress workers staged a demonstration demanding Jitin Prasada be given ticket from the constituency. Prasada says “I am a disciplined soldier of the party and will do what I am told. I have worked for 15 years with the people of Dhaurahra, this is a deep and unbreakable relation. Respecting the feeling of the people and workers, I will talk with the leadership and insist." Seventeen leaders of Mizoram BJP have quit alleging that the Prime Minister Narendra Modi-led government is fascist. The BJP members were upset with the nomination of a Chakma candidate for Lok Sabha polls. Cong, NC, PDP is Responsible for Situation in J&K: Modi | "Does the country need a Mahamilavati government at the centre? Congress advisors sitting abroad are giving a clean cheat to Pakistan and the terrorists. The whole country is talking today in one voice, but the Congress leaders are the second voice. When Guru is like this then you can imagine how will be the disciples be and disciples friends. Congress, NC and PDP coalition is responsible for the condition the state is in today. Kashmiri Pandits have suffered a lot because of PDP, Congress and NC. Sadly, national security is not a priority for them, they only care about power," Modi said. 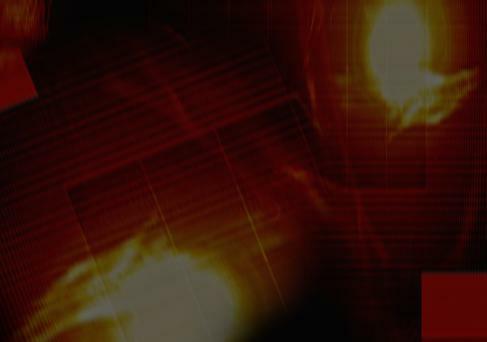 Cong, NC, PDP is Responsible for Situation in J&K: Modi | "Does the country need a Mahamilavati government at the centre? Congress advisors sitting abroad are giving a clean cheat to Pakistan and the terrorists. The whole country is talking today in one voice, but the Congress leaders talk in a different voice. When Guru is like this then you can imagine how will be the disciples be and disciples friends. Congress, NC and PDP coalition is responsible for the condition the state is in today. Kashmiri Pandits have suffered a lot because of PDP, Congress and NC," Modi said. Congress leaders giving statements on Balakote strike which are not in the interest of the country. I do not understand whether this is the same Congress, in which Netaji Subhash Chandra Bose envisioned the Azad Bharat. Do you all agree with Congress, PDP and NC’s language? Their statements are being cherished in Pakistan, Modi added. Tej Pratap Yadav tweets that he has resigned as Chief of RJD's Student Wing. Congress party's Sam Pitroda wanted us to engage in dialogue with Pakistan. We will not tolerate terrorism of any kind in the country. The opposition that doesn't have a prime ministerial candidate or a policy, can't develop the country or work for the welfare of the people: Amit Shah. BJP Kozhikode Lok Sabha candidate Prakash Babu remanded to 14 days judicial custody by Pathanamthitta Court in connection with Sabarimala case violence. Speaking to CNN-News18, DMK MP Kanimozhi said, “Employment is a major issue faced by the people of Tamil Nadu, the other crisis are sterlite and water scarcity. DMK will focus on secularism and freedom of expression.” On being asked about contesting from Tuticorin and on the being considered as an outsider, she said, “There is no governance in Tuticorin. I have been working for the constituency for the last ten years. I am not considered an outsider… The only one who calls me an outsider is the BJP candidate.” She also said the BJP government failed to enact Women’s quota bill. Samajwadi Party releases the candidates' list for Uttar Pradesh Lok Sabha elections. Former BSP MLA Puja Pal would contest from Unnao. 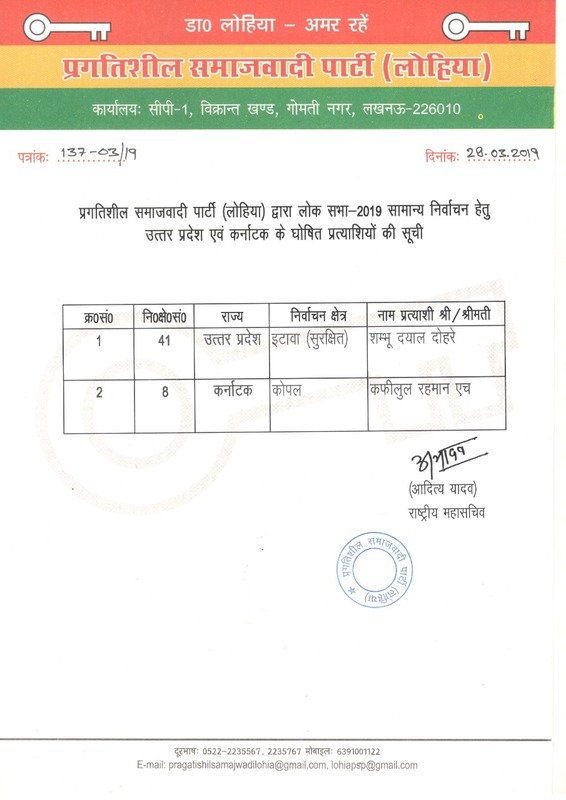 Nasir Qureshi will contest from Moradabad, Bhagwat Sharan Gangwar from Bareily, Shyam Sunder Yadav from Jhansi and Nathuni Prasad Kushwaha from Kushinagar. A furious Kumaraswamy has blamed PM Modi for the raids in Hassan and Mandya, and had warned he would use tactics like Mamata Banerjee against any move by the Centre of political vendetta. File photo of Manvendra Singh. The Congress is blinded by its "anti-Modi approach" and has stopped thinking in the nation's interest, Prime Minister Narendra Modi said in Jammu and Kashmir’s Akhnoor on Thursday, raising issues of national security and terrorism and questioning the party's statements following the Balakot strike. Addressing his first rally in the state after national elections were announced on March 10, Modi claimed the speeches of Congress leaders receive applause in Pakistan. Congress president Rahul Gandhi today promised to ease business opportunities for entrepreneurs, saying that the party would free the new business from clutches of red tape, and allow easy access to bank credit if Congress is voted to power. He also promised that new ventures by youth will not require any permission to operate for three years. 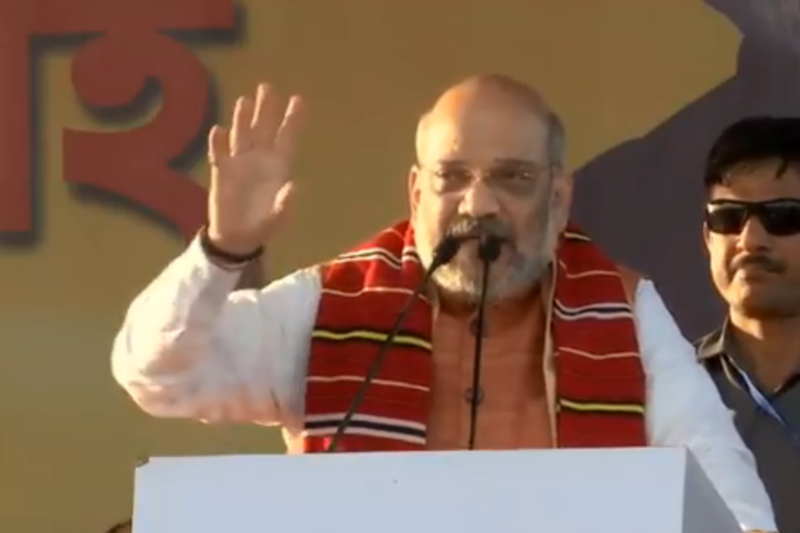 BJP chief Amit Shah, meanwhile, promised to deport immigrants from Assam if the BJP and Prime Minister return to power, and said it was only the saffron party that brought development to the northeastern state. He also attacked the Congress over national security, and said only BJP and Modi can protect India's borders. 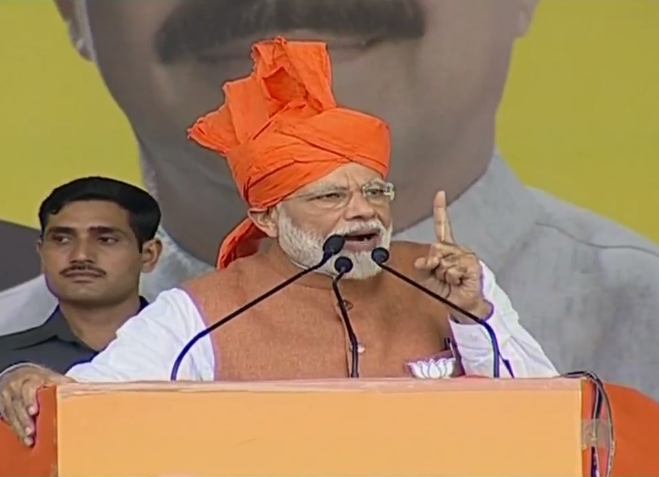 Earlier, Prime Minister Narendra Modi said in Uttarakhand that the state did not witness any development before 2014 because of the policies of the Congress, which was also responsible for the corruption plaguing the state. In Meerut, he said the people of India had decided the mandate for 2019 and were ready to bring the BJP back to power. Addressing an election rally, Modi said, “I will give you an account of what I did...and I will also get you an account of what others have done...you know I am your ‘chowkidar’ and I will do justice to you...there will be accountability and everyone will be made accountable.” He also coined the acronym SARAB to hit out at the UP mahagathbandan, inviting Opposition ire. Meanwhile, rebel BJP MP Shatrughan Sinha will join the Congress on April 6 after much dilly-dallying. Sinha was supposed to join the grand old party today but it was delayed after tussle intensified within the Bihar Mahagathbandhan over seat sharing. Veteran Congress leader Ramdeo Rai has reportedly told the top brass that the seat-sharing arrangement was not in favour of the grand old party and also questioned the Congress’s decision to hold discussions on the seats it holds. He added that the Congress must not be considered a rookie player in coalition politics and the party would gain strength only if it wins in Darbhanga and Aurangabad. The development comes a day after the Darbhanga Lok Sabha seat, represented by former test cricketer Kirti Azad who recently quit the BJP and joined the Congress, emerged as the new bone of contention in the Mahagathbandhan, with the RJD stating that it wished to field its veteran leader Abdul Bari Siddiqui from the seat. The Lalu Prasad-led party contended that its candidate had lost the seat to the BJP by a thin margin in 2014. State Congress president Madan Mohan Jha, when approached with queries about the RJD's claim, had said Darbhanga was an "important seat", but a final call will be taken by the party's high command. In a pre-dawn swoop today, Income Tax officials along with CRPF personnel carried out raids at the residences of Karnataka Minor Irrigation Minister CS Puttaraju and his nephew. Speaking to a private news channel, JD(S) leader Puttaraju said three teams of Income Tax officials and Central Reserve Police Force (CRPF) personnel carried out raids at his Chinnakurli residence in Mandya and his nephew's house in Mysuru. The development came a day after, Karnataka Chief Minister HD Kumaraswamy raised fears about possible raids on Congress and JD(S) functionaries in the state. He had claimed that CRPF personnel were brought from various parts of the country to carry out the raids in the state. Raids on Congress and JD(S) leaders can take place early Thursday morning using CRPF jawans instead of taking the help of the Karnataka Police in order to maintain secrecy, Kumaraswamy had claimed on Wednesday. "Three teams of I-T officials and CRPF soldiers comprising eight soldiers carried out raids at my Chinnakurli residence in Mandya and my nephew's residence in Mysuru," Puttaraju told the channel.